The Latin name for Cuban oregano is Plectranthus barbatus. It's a perennial plant with a flavor similar to oregano that is actually native to southern and eastern Africa, but which has also found hospitable homes in the Caribbean tropics. 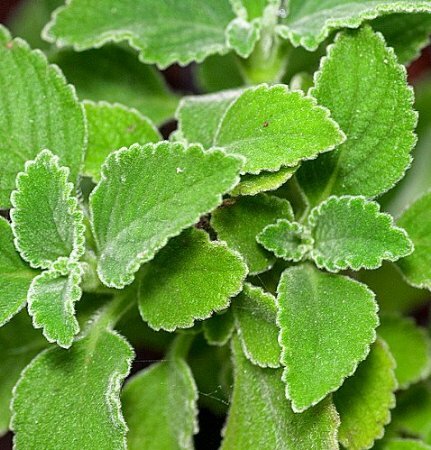 Like many succulent plants, Cuban oregano has the stem with the rectangular cross section, plus leaves that are thick, grey-green, fuzzy, and succulent. When mature, the plant reaches 50 cm in height. The leaves have a strong aroma, particularly when handled by hand. The ideal conditions for Cuban oregano are well-drained soil with partial shade. In cold climates, it can be grown in a pot and brought inside during cold weather. It only needs water sparingly. Ships in a 2.5 inch pot.